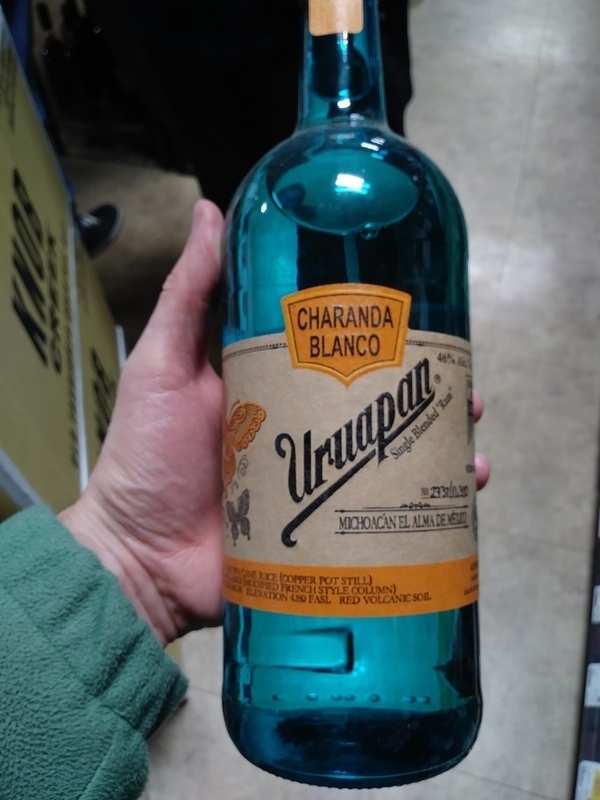 Have you found an online vendor selling Uruapan Charanda Blanco? Like, not love, and will probably mix with it from now on. Cool bottle tho! Enjoyed a glass of Uruapan Mexican rum with my friend during a 5,000 mile road trip across 18 States. Bottle and label design look very nice and artsy. Super dry Rhum Agricole notes straight to your nose and palate. Very strong and dry burn at the end. For Rhum Agricole lovers, add 2 points. This is a very unique rum hailing from Mexico, well done. 46% ABV. Bottle 2155/16300 (wow, that's dedication to hand-numbering!). Big nose. Creamed corn, brine, touch of cane. An herbal note. Later, that industrial plastic/diaper note I really don't care for surfaces briefly. Just a hint, though. Shortly thereafter this shifts into more of a Gak/putty aroma (unmistakably), and that sticks around for the long haul. Cane sugar on the palate. Frosted Flakes? (But not that sweet.) Rather briny finish that mellows after a while.